00:05:00 Makes 1 serving, one sandwich (112 g). Makes 1 serving, one sandwich (112 g). Need some lunchtime inspiration? 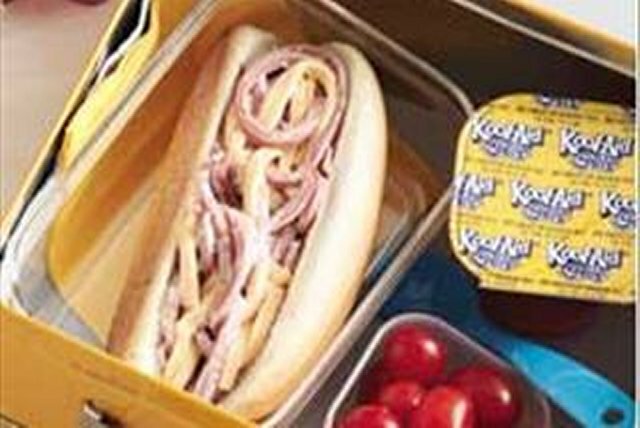 This fun bologna and KRAFT SINGLES Cheese Slice sandwich will beat the lunchbox blues. Cut bologna and Singles into very thin strips; mix lightly. Spread bun with Miracle Whip; fill with bologna mixture. Place 1 pickle slice in bun before adding bologna mixture. Prepare as directed, using Miracle Whip Calorie-Wise Dressing and a Kraft Singles Light Slice. Serving Size Makes 1 serving, one sandwich (112 g).